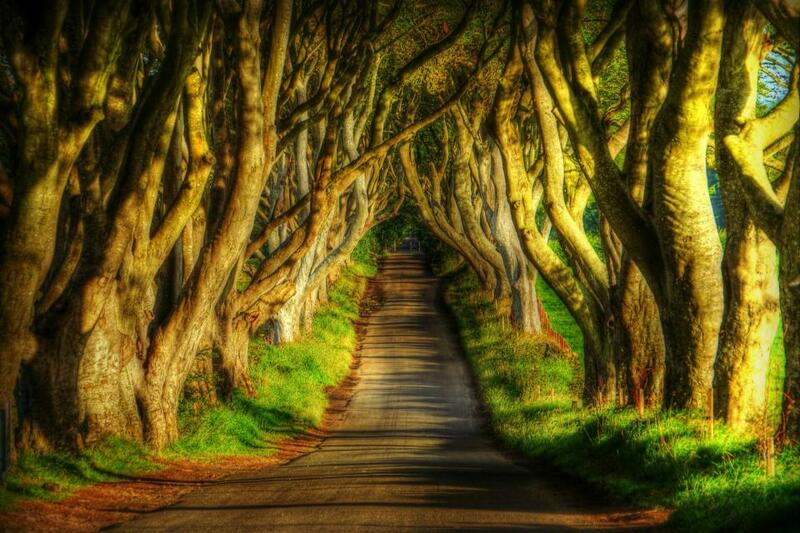 The Dark Hedges are located in Ballymoney, County Antrim, Northern Ireland. I had always wanted to capture this photo, way before The Game of Thrones made them famous as The King's Road. I arrived well before sunrise, and was the only person there until a French photographer came along. He did not speak any English nor did I speak any French, but we got along famously and stayed out of each other's shots. It was a cloudy morning and it did not seem like we would see any sun at all. We shot for a long time and then packed up our gear, and he went one way, while I turned to go the other way. At that moment, the clouds moved and the sun broke through the trees on the right, resulting in beautiful light and awesome shadows on the road. I yelled "Hey!" to my new French friend and pointed. He came running back. Hopefully he got some nice shots as well! I love this effect. Great work! Gorgeous image Colette! I love the effect you used on this beautiful road in Ireland.